This uniquely shaped and amazingly decorated vase is from the End Of Day® series, meaning it is made with a variety of colors used throughout the day. The colors are very deep and intense, and contain nearly every color in the rainbow. 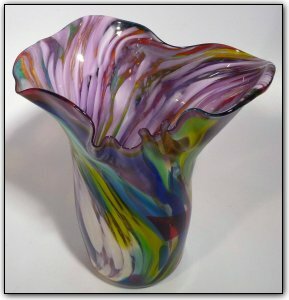 Make sure to zoom in to see the true lovliness of this piece, with the rich rainbow of colors and one-of-a-kind shape, this certainly is a unique and amazing vase!